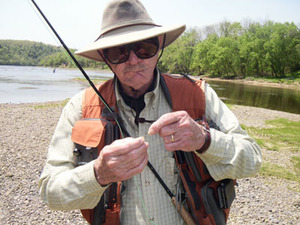 I have been fly fishing since 1970. I received my first fly rod around 1965. It was an 8 weight, 9’ fiberglas Fenwick rod and reel. (I still have it.) I hardly knew one end from the other. At that time, there were no fly fishing schools or You-Tube videos available. So, I was self-taught. It was terrible and frustrating. I gave up several times, but always went back and tried again. Eventually I learned enough to get 30 or 40 feet of line out and catch a few fish. The only reason I didn’t quit was because I was so passionate about this sport! I just couldn’t give it up. I am telling you this to let you know that I have made all the mistakes and felt all the frustrations of fly casting. I have had to overcome the bad habits developed in my early years as well. I love what I do because I can help you skip through the mistakes and enjoy this gentle sport quickly! Fly fishers can spend a lot of money on travel, equipment and clothes – but it is all optional. Any body of water that holds fish is your arena; equipment is available in a wide range of prices, and a large percentage of anglers are women and young adults. The poetry of a looping line is accessible to all. Here are my thoughts on fly fishing. In my opinion fly fishing is the most exciting, enjoyable, rewarding, relaxing, addictive and just plain fun outdoor activity you will ever involve yourself in. Having said that, there are a few misconceptions about the sport which I would like to clear up. It seems that a lot of people think fly fishing is just fishing for trout. Nothing could be further from the truth. There is a fly rod and flies designed and tied for almost every species of fish, whether it is fresh or salt water. 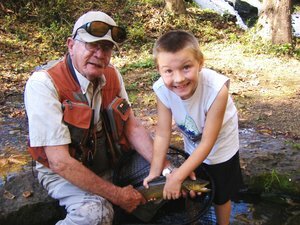 We are fortunate here in the Twin Lakes area to have so many species of fish in our lakes, rivers and streams and they can all be taken on a fly rod. Even the “lowly carp” is a real hoot to catch. They are smart, strong and there are lots of them in our streams and lakes. Another huge misconception is that casting a fly line is difficult. That just ain’t true. Casting is like swinging a golf club. Just learn a few basic moves, then practice! To me, fly fishing is so much more than just catching a fish. 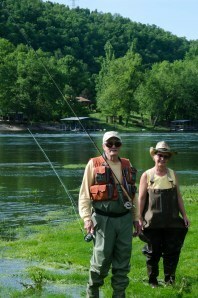 I have asked several fly fishermen and women what it is about the sport that is so enjoyable and addictive. Each person I asked gave me a different reason. To some, it is the beauty of the area, for others it is the challenge, the peace and solitude...the excitement of hooking a fish on a tiny artificial insect. I could talk to you for hours about the truly incredible things I have experienced while standing knee deep in a stream with a fly rod in my hand. I think the reason I am so passionate about the sport is all of the above. 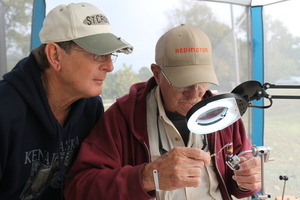 For thirty + years, fly fishing has been a source of true happiness for me, and after all, isn't that why we are here. When I'm not out on the lake or river, and I'm not home tying flies, I love spending time with my wife and grandchildren.